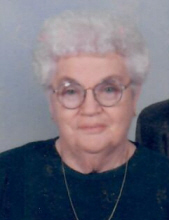 Kathryn June Summers, 92, of West Frankfort, Illinois, passed away Tuesday January 29, 2019 in her residence at 5:20p.m. Kathryn was born November 18, 1926 in buncombe, Illinois to William and Lillian (Sanders) Frick. She was a member of First Church of God - West Frankfort, Illinois. Kathryn loved her family,church, crocheting, sewing, and gardening. She was preceded in death by her husband, Joe Summers on November 6, 2006; parents; grandson, Timothy Summers; granddaughter, Shelly Summers; four brothers; one sister. Kathryn is survived by her sons: Rick (Rita) Summers and Don Summers; granddaughter, Tammy (Johnny) Jearlds; three great grandchildren: Cody, Jonathan, and Shyanne. Funeral services will be held at 2:00p.m. on Saturday February 2, 2019 at First Church of God – West Frankfort, Illinois with Pastor Gayle Stone and Brother Joe Daniels officiating. Burial will be in Denning Cemetery on the Orient Road. Visitation will be held from 12:00-2:00p.m. at the church prior to the service. Memorials may be made to First Church of God or to Hospice of Southern Illinois. Envelopes will be available and accepted at the church. To send flowers or a remembrance gift to the family of Kathryn June Summers, please visit our Tribute Store. "Email Address" would like to share the life celebration of Kathryn June Summers. Click on the "link" to go to share a favorite memory or leave a condolence message for the family.